And I am ever still the worst blogger ever. Christmas in almost a month past (as is my last post), and I have yet to write about it. Sorry. A million times, sorry. 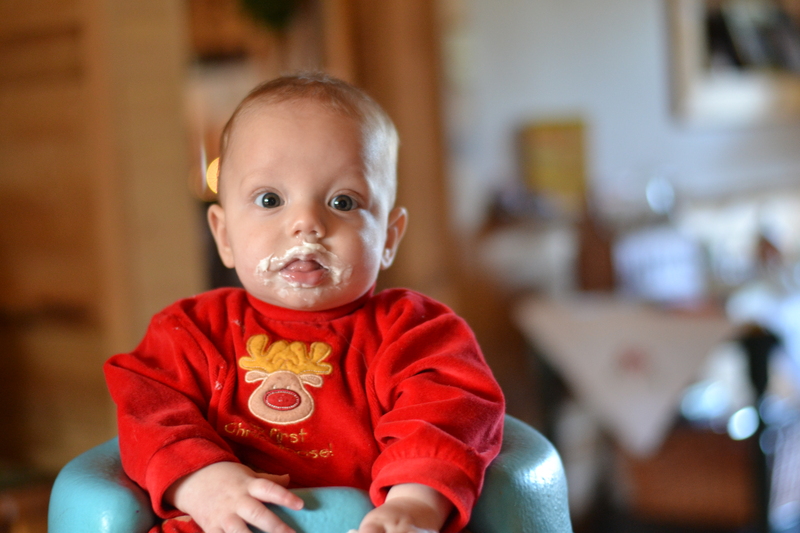 It was our little boy’s first Christmas this year. He was 5 months old. It was really sweet. He was spoiled to death, but it was really great. Cael really enjoyed the icing we were using to decorate the gingerbread house. Isn’t he especially cute in his ‘First Christ-Moose’ suit? So! Christmas was great. It was really busy. I really enjoyed having my friends come home (especially those that are FAR away). It was really awesome to spend time with them, and catch up. I can’t wait until that happens again. Thing is, soon enough, they’re all going to get married and will probably stop coming to visit me so often… I’m hoping that doesn’t happen (I WANT them to get married, but they need to keep visiting…!!). Anyways, enough with that. Time with family was great too. We just took our Christmas tree out on Saturday actually. It was really nice to have it up for a while afterwards. It was getting pretty dry though. It left most of its needles on our living room floor on its way out the door. So now, the house is in more order (if that’s possible in a house of 9?). We ate so much food through the season. 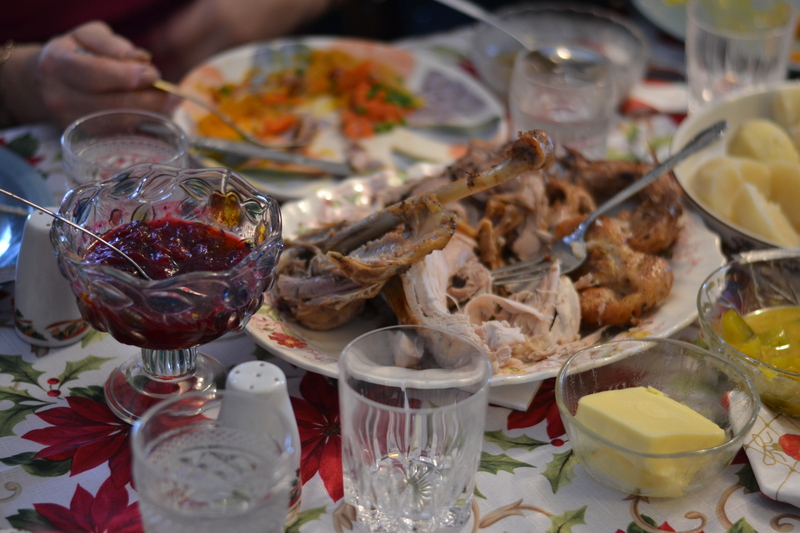 Multiple turkey dinners, lots of sweets, it was great. 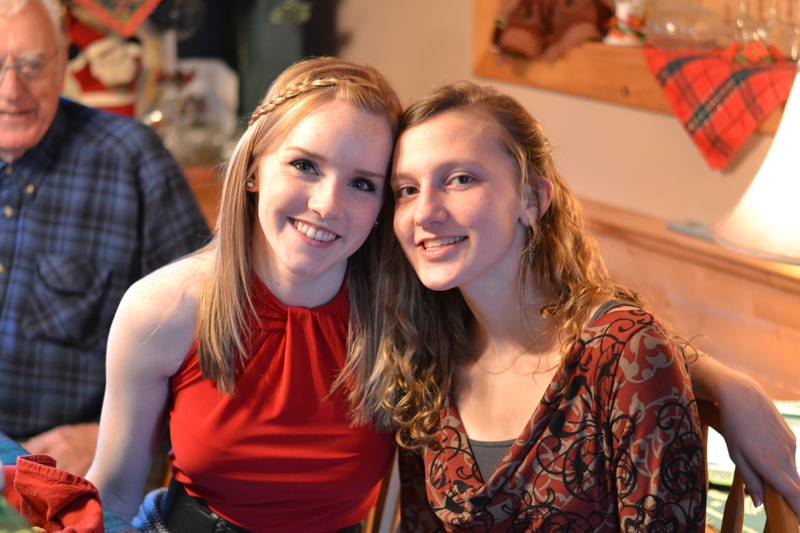 Me and my beautiful cousin Allie at our family Christmas Eve supper. Our Christmas morning is always my favourite part. We get up around 7 (I’m in charge of getting my brothers up on time, and keeping them quiet as to not wake up my husband). Then we go downstairs and go through our stockings – which are massive. They are at least 3 feet long. My mother made them when I was about 10, and I just made 3 for my own little family. They’re really great though. My all-time favourite. We then get dressed up, and have a good old-fashioned breakfast of homemade brown bread, fried baloney, and eggs – SO good. After that, we read the Christmas story. We read it out of a picture book, and then the account from Luke 2. Read it. We read it before we open our gifts as a reminder as to what we’re actually celebrating. Not presents, not family; we’re celebrating the miraculous birth of our One and Only Saviour. He is why we celebrate. We read the story, and then we pray and thank God for the best gift of all. Only after that do we start opening presents. This year, we had church in the morning (as Christmas was on Sunday), so only a few presents got opened before church. Then we have multiple turkey dinners, go to grandparents, etc… This year, we didn’t get our presents all opened until 10:30! PM! Our first turkey dinner of the week. In all, it was really great. Loved it. How was your Christmas? What do you do special to celebrate? Kayleigh, you KNOW you have a taste-tester close by any time you want! Except I’ve promised to take off many pounds this year… 😦 Love to all of you!! !